Alexander Williams, B.Sc., M.Sc. (Hons), Th.C., Dip.C.S., ThL. Alex Williams is a Research Associate at the Western Australian Herbarium specializing in the taxonomy of grasses. He is married to Barbara, has 3 daughters, and 3 grandchildren, and attends St Matthews Anglican church, in Shenton Park. He has spent most of his professional career as a government botanist plus 7 years in missionary work. For his undergraduate degree at the University of New England he did a double major in botany, then honours work on the biogeography and ecology of Australian grasses, followed later by a Master of Science (Honours) degree in radioecology (the environmental migration of radioactive isotopes) from Macquarie University in Sydney. In this latter field he was the Australian representative to a United Nations’ International Atomic Energy Agency coordinated research program between 1976 and 1980 and from this he developed an international reputation and was invited to give the review paper in his field at an international symposium in 1981. As a result of this, the UN invited him to head up an international group to produce a book, The Behaviour of Radium in Waterways and Aquifers. This led to a further invitation to be in charge of a much larger group of international scientists in producing a two-volume monograph, The Environmental Behaviour of Radium (1990). 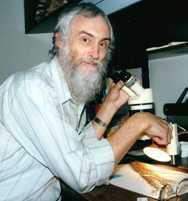 He was elected to membership of the Australian Institute of Biology in 1989. His current work in taxonomy has led to publication in the Flora of Australia of new species and a genus revision for the salt grasses (Puccinellia spp.) of Australia, and new species and subgenus revisions amongst the spear grasses (Austrostipa spp.) of Western Australia. Alex gained a Certificate in Theology from Moore Theological College in Sydney, and he and his wife responded to a call to missionary work in 1989. They went to India for a ‘trial run’ in 1990 then to Tabor College in Adelaide in 1991 where Alex gained a Diploma in Christian Studies. He followed this up with an Associate Diploma from the Bible College of South Australia in 1992, specializing in missiology. They served with the Anglican Mission to Seamen at Dampier in northwest Western Australia from 1993–96 and moved to Perth in 1997 where Alex continued his studies and gained a Licentiate in Theology from the Australian College of Theology. His key areas of expertise are in botany, radioecology, radiochemistry and statistics and he has published in all these areas. But a personal interest in cosmology and popular science writing also led to a recently completed book entitled Dismantling the Big Bang: God’s Universe Rediscovered co-authored with physicist Dr John Hartnett from the University of Western Australia. Alex was brought up in the Anglican Church but was never taught six-day creation. He accepted evolution as taught at school and university, but first began to doubt it in 1970 when he had to teach Pasteur’s work refuting the theory of spontaneous generation. He realized that if ‘life comes from life’ and not from non-living matter, then the first life must have been specially created. At the time however, he had no way of pursuing the matter. It was not until he later encountered the Creation Research Society and the Creation Science Foundation (now CMI) that his thinking began to change. When he read Duane Gish’s book Evolution: The fossils say No! and Whitcomb and Morris’s book The Genesis Flood he realized that evolution and uniformitarianism did not fit the facts of science, so he abandoned them and adopted six-day creation and the biblical time scale. Alex reasons that it is logically absurd for Christians to worship the God of the Bible as Creator and yet not believe what He says on the subject of creation. His current interest is investigating the personal, spiritual and theological implications of mankind having not believed what God says, nor obeyed it, since the beginning.